Any pizza lover will tell you: “The secret is in the sauce”. At Pizzoun, we know sauce is very important if you want to craft the best pizza possible. When we were looking for whole tomatoes to use for our pizza sauce, we did a lot of testing. 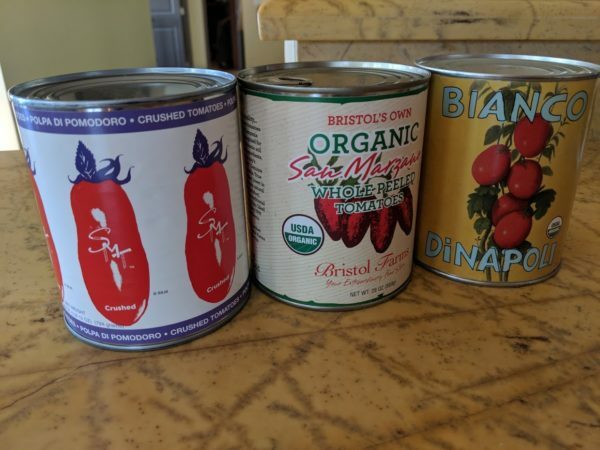 We tried different organic canned tomatoes, including both imported and domestic brands. We soon realized that we could source fantastic, high-quality organic tomatoes from our home state of California. We fell in love with Bianco DiNapoli Organic Whole Tomatoes. They have the best flavor and pair perfectly with the other organic ingredients in our homemade tomato sauce. You will love our organic tomato sauce on your next pizza! Seeds, a field and a quiet factory. That’s how it begins each winter. By summer, the California tomato harvest begins. Our mission is to bring you the very best tomatoes that Mother Nature and human ingenuity has to offer. Organically grown, hand selected, grown and processed in California. You are invited to search our website, meet the people and businesses that help produce our tomatoes. Ask questions. Give us feedback. Help us Connect the Dots!